Quick post! This dip is one of my favorites and after a whirl in the food processor, it’s done. I know, you could just buy the hummus at the store, but what fun is that? 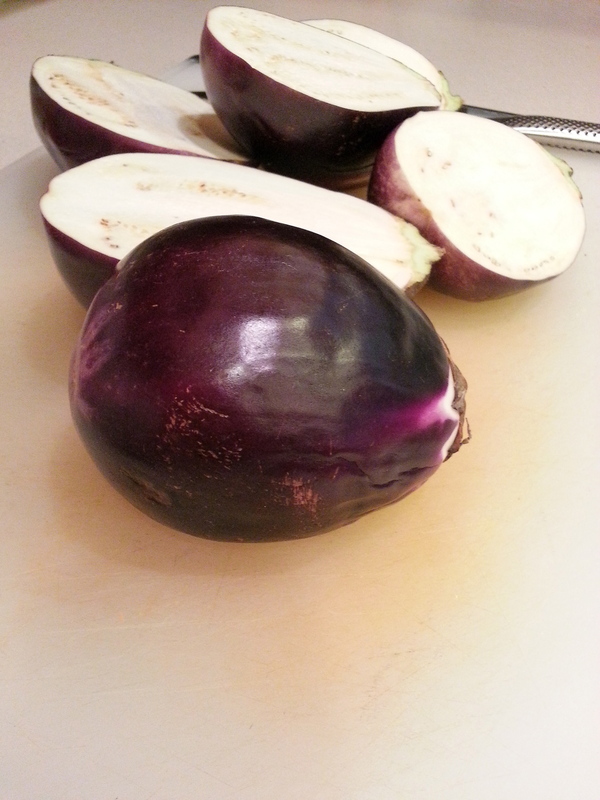 I made this one when I got three small Sicilian eggplants from the farmers market. 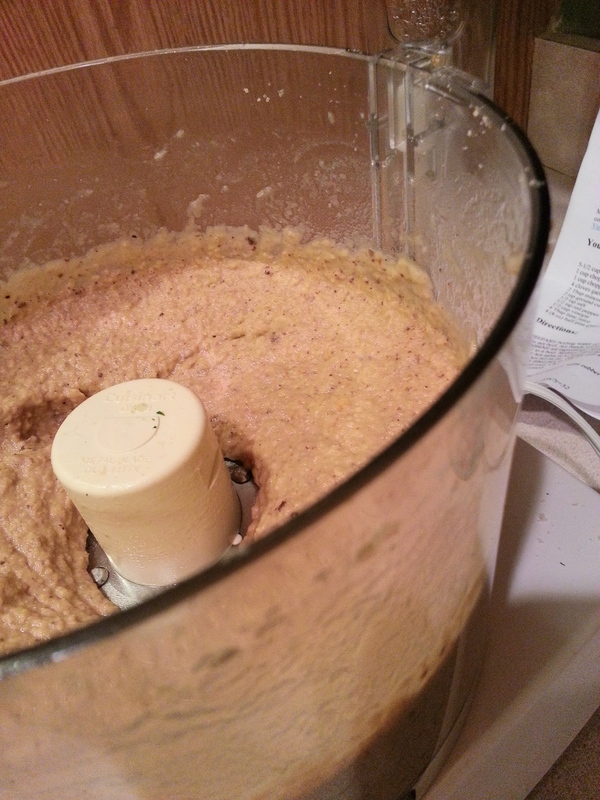 I like it because the roasted eggplant helps give the hummus a great thick consistency. I’ll take eggplant however I can get it since I tend to shy away from the heavy breaded and cheesy eggplant parmesan (yummy goodness). Don’t get me wrong though – I will indulge in that from time to time, but this is another use for eggplant, other than grilling it or using it as a vessel to stuff. I know this recipe is from Cooking Light, but since it is ancient, I can’t get the exact link. But since I don’t like recipes that call for partial cans, I adjusted it anyway, so that I can use the whole can. I just know that if I would put a half can of garbanzo beans in my fridge, that they would end up in the back, behind my containers of sour cream and jars of salsa. That’s just how this family rolls. Happy dipping kids. Preheat the oven to 350. Cut eggplant(s) in half lengthwise and score the flesh in a crisscross pattern at 1 inch intervals and about 1/2 inch deep. Rub cut sides with 3 tablespoons of olive oil. Sprinkle with kosher salt, fresh ground pepper and depending on your heat preference – red chili flakes. 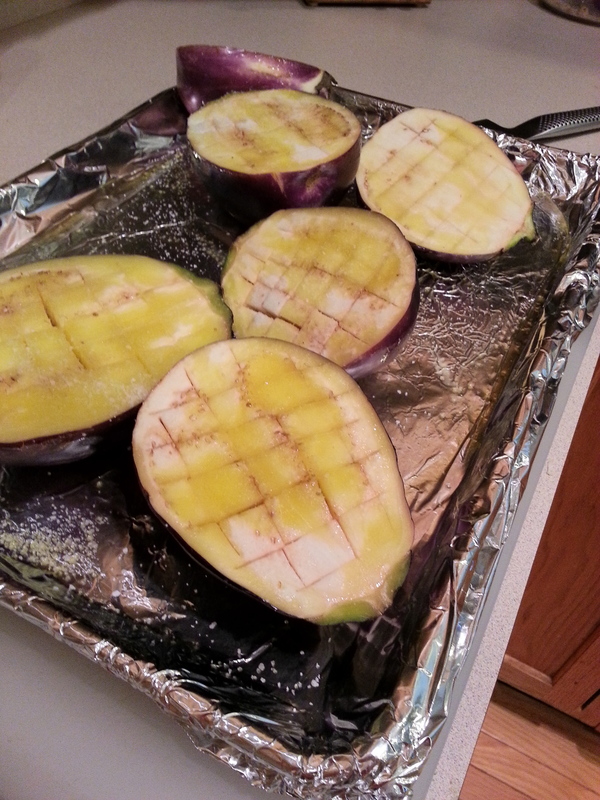 Place eggplant, cut side down, on a rimmed baking sheet covered in foil and sprayed with non-stick spray. Bake until tender, about 1 1/2 hours. Cool slightly, then scoop flesh into a food processor and discard the skins. Add the garbanzo beans, remaining 2 TB olive oil, lemon juice, tahini and garlic. Puree until mixture is almost smooth. Season with salt and pepper and then transfer to a serving bowl and stir in parsley. Serve with pita chips or raw vegetables. Because I have a penchant for heat, I like to drizzle my portion with hot sauce. Just sayin. note: This dip makes about 2 cups. This entry was posted in appetizers and tagged eggplant, hummus, roasted. Bookmark the permalink.